On Friday ,7th September a book, “Human Rights: Text and Context written by Dr. Shubhash Sharma was launched at AN Sinha Institute , Patna. After the Introduction by Dr. Professor. 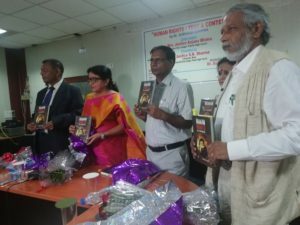 Narayan , the book was launched. Dr.Professor Shankar Ashish Dutt, HOD, English department, Patna University and the key speaker for the event said ,”I remember being here about a month ago, Dr. Shubhash Sharma has released a book ,which is translated by Dr. VK Jha , professor, Dept. of English, H. Siddhu Kanu University, Dumka. This book contains 21 anthology call Speechless and other stories. The dignity of human individual seems to be very consciousness of Dr. Sharma. To my mind the whole idea of Human Rights actually stems from this idea of human responsibilities. The chief guest for the press conference was Justice Anjana Mishra of the Patna High Court. The conference was presided over by Justice SK Sharma , Lokayukt , Bihar.